We are Manufacturers and exporters of high quality Icing Sugarfrom India. Our Icing Sugaris widely used in various Industries including Hotels, restaurants and Coffee shops. Our Icing Sugaris widely used in bakery, soft drinks, ice creams , herbal cosmetics and squashes etc. We are exporting Icing SugarSyrup to various countries like Middle East, UAE, Israel, Dubai, Poland etc. 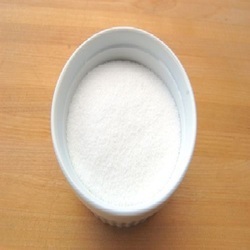 We are manufacturer and exporter of Icing Sugar. Icing sugar is made by grinding white sugar into a fine powder.Icing sugar is a very versatile ingredient used often in making cakes and other bakery products; it is used for icings and frosting or dusted over desserts. Since it dissolves quickly in cold water, some people also keep it on hand to add to juices, milkshakes, and other cold beverages.